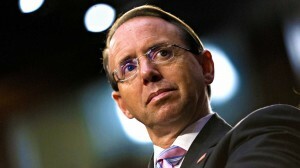 The New York Times is reporting that deputy attorney general, Rod Rosenstein suggested last year that he secretly record President Trump in the White House to expose the chaos consuming the administration, and he discussed recruiting cabinet members to invoke the 25th Amendment to remove Mr. Trump from office for being unfit. The information is reported to have come from memos written by Andrew McCabe, then the acting FBI director. McCabe declined to comment. According to a lawyer for Mr. McCabe, his clients memos have been turned over to the special counsel, Robert S. Mueller III, in the investigation into whether Trump associates conspired with Russia’s election interference. Interesting. If true, Rosenstein needs to be fired immediately. But is it true and one might want to consider the source of this leak. Was it McCabe or maybe the special counsel. Regardless, a special counsel needs to be put in place to investigate the deep state and all that they have done to thwart the Trump presidency and over throw a presidential election. A question does arise as to why the New York Times would report such a story. I would ask why? Why now? The Times as been a part of the liberal media’s attack on Trump. Why would they report such a story now? Who thinks this is an attempt to rile up Trump so that he fires Rosenstein prior to the 2018 midterms. Isn’t this what was wanted all along? Then the NY Times and the rest of the liberal media gets to cry obstruction of justice. The deep state and the media are very slick and despicable. Do not think they will attempt anything to overthrow this president. UPDATE I: From the Gateway Pundit, following the New York Times released its report, Andrew McCabe made a statement through his lawyer Michael Bromwich. Interesting, he did not deny The NY Times report. “Andrew McCabe drafted memos to memorialize significant discussions he had with some high level officials and preserved them so he would have an accurate contemporaneous record of those discussions. When he was interviewed by the Special Counsel more than a year ago, he gave all of his memos — classified and unclassified — to the Special Counsel’s office,” Michael Bromwich said in an email. UPDATE II: Rosenstein denies the report … The Story Is ‘Inaccurate and Factually Incorrect’. Deputy Attorney General Rod Rosenstein on Friday denied a New York Times report claiming that he suggested last year that he secretly record Donald Trump in the White House and discussed invoking the 25th Amendment to remove the president from office. On Saturday, Judicial Watch President Tom Fitton announced documents related to the FISA warrants on Donald Trump’s former campaign advisor, Carter Page, were released by the FBI and received at the JW headquarters. This is a long time in coming. From JW, the pending document production comes in a February 2018 Judicial Watch Freedom of Information Act (FOIA) lawsuit filed after the DOJ rejected a July 19, 2017, FOIA request (Judicial Watch v. U.S. Department of Justice (No. 1:18-cv-00245)). The docs show exactly what many of us suspected since the outset. These documents are heavily redacted but seem to confirm the FBI and DOJ misled the courts in withholding the material information. Click HERE to see docs, JW v DOJ FISA Warrant Docs 00245. Judicial Watch Obtains Carter Page FISA Court Documents. The documents were due to Judicial Watch yesterday but were emailed around 5:30 pm today. The warrants are controversial because the FISA court was never told that the key information justifying the requests came from a “dossier” that was created by Fusion GPS, a paid agent of the Clinton campaign and Democratic National Committee. The initial Carter Page warrant was granted just weeks before the 2016 election. Today’s document release supports criticisms by Republicans on the House Intelligence Committee who released a memo that criticized the FISA targeting. The memo details how the “minimally corroborated” Clinton-DNC dossier was an essential part of the FBI and DOJ’s applications for surveillance warrants to spy on Page. Fitton and others call for declassification of documents. This morning during the House Judiciary Committee Hearing with Deputy AG Rosenstein and FBI Director Wray, Rep. Trey Gowdy (R-SC) blasted both of them for their continual delay tactics, stone walling, and lack of producing documents. 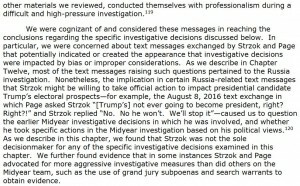 Gowdy questioned why the so-called “neutral and dispassionate” bias FBI agent Peter Strzok was talking about impeachment within 3 days of Special Counsel Mueller being appointed. That was quicker than the liberal MSM like MSNBC spoke of it. Watch Gowdy eviscerate Rosenstein and Wray. Rep. Trey Gowdy, R-S.C., on Thursday excoriated Deputy Attorney General Rod Rosenstein and FBI Director Christopher Wray instead of asking questions in his first five minutes during the top law enforcement officials’ testimony before the House Judiciary Committee. “If you have evidence of wrongdoing by any member of the Trump campaign, present it to the damn grand jury,” Gowdy, who is chairman of the House Oversight Committee, said Thursday in reference to special counsel Robert Mueller’s federal Russia investigation. “No. No he’s not. We’ll stop it” … YOU CAN BET YOUR A$$, THERE WAS POLITICAL BIAS GOING ON IN THE FBI!!! According to the Inspector General Michael Horowitz report (pg. 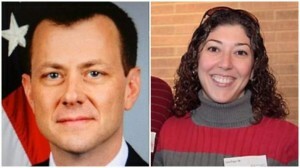 149), the IG revealed an incredibly damning message between FBI agent lovebirds Peter Strzok to Lisa Page. However, the majorly concerning aspect of this revelation was that the text message had been previously hidden from Congress. A bombshell report released Thursday by the Justice Department’s inspector general includes new evidence that an FBI agent and an agency lawyer who were having an affair in 2016 were also plotting to keep President Donald Trump from winning the election. In an email on August 8, 2016, Special Agent Peter Strzok reassured Page that she needn’t worry about Trump winning the White House. Trump is ‘not ever going to become president, right? Right? !’ Page texted Strzok. ‘No. No he’s not. We’ll stop it,’ he responded. WE’LL STOP IT?!? HOW IN THE HELL IS NOT NOT POLITICAL BIAS? 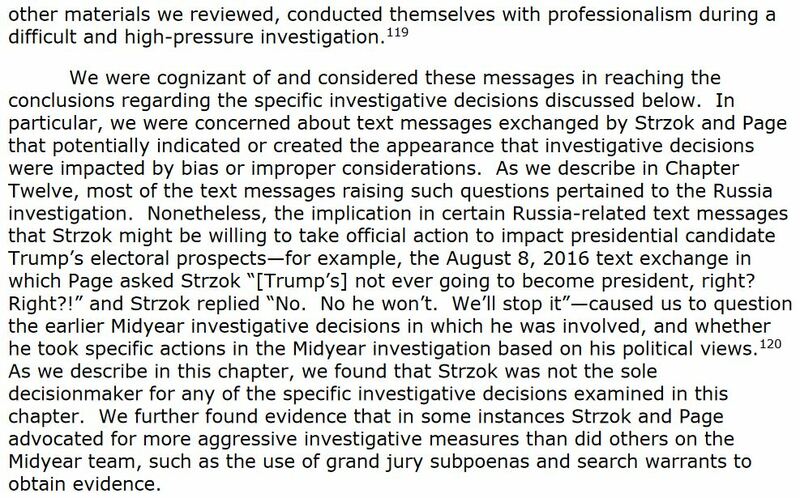 Also, who is the “We’ll” that Strzok is referring to? Hmm, could that be a conspiracy among the Deep State? The Gateway Pundit asks, “Who deleted this second part of the message?” A very good question, but of course there is no political bias at the FBI.